When selecting a motor for your application, one piece of reference information that can be used to make your selection is the speed vs torque curve. The curve provides the output torque of the motor relative to the speed at which the motor is operating. By reading the curve, you can confirm that the motor will provide enough torque over the speed range in your application. Curves typically show 2 ranges – Continuous and Intermittent. 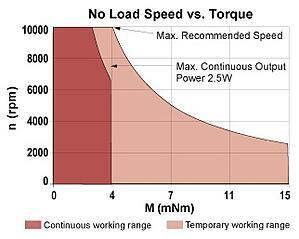 The Continuous range shows the maximum torque (and corresponding speed) the motor can run at 100% duty cycle. The Intermittent range shows the torque the motor can produce at less than 100% duty cycle. There are many factors that come into play when evaluating how much torque you should expect which will be covered in a future post. It is important to note that due to the linear relationship of speed and torque of a DC motor, the more torque the motor produces, the lower the output speed capability of the motor. This can be countered by increasing the supply voltage to the motor to allow more speed capability. When reading speed vs torque curves on-line however, it is important to note the speed you can achieve for a given torque to make certain you can meet your application working point(s). Since catalog curves are static, this can be difficult to accomplish. Portescap’s MotionCompass provides you with speed vs torque curves for the recommended motors at the given input voltage. This allows you to decide that the motor will provide you with the proper speed at your required torque. Application Engineers are always available to discuss your requirements and provide the optimum motor for you.